Major step forward: the FDA has committed resources to the development of tools for Holter ECG analytics in thorough QT studies. A couple of weeks ago the FDA released information about enabling the use of continuous Holter 12-lead ECGs in the existing ECG warehouse currrently limited to extracted HL7 aECG recordings. This development is described by the Agency as ".. the first step in positioning the FDA to request the upload of continuous recordings as part of the cardiac safety regulatory review process". Meanwhile next month, a former student from the THEW Educational Program will start a two-year fellowship aiming at the development of Holter-based quality metrics for the review of Holter data from thorough QT studies at the CDER on the FDA campus (Silver Spring, MD). This interest of the Agency for continuous ECG recordings seems to be driven primarily by the need for a better assessment of the role of autonomic regulation and heart rate on QT interval measurements in thorough QT studies. As we have highlighted in our previous Newsletter and we continue to do in this new release, the role of continuous ECGs is crucial to the assessment of drug-induced QT interval prolongation, and the intention of the FDA to have access to full 24-hour Holter ECGs represents a major step forward to investigate QT interval and drug interaction in a more meaningful manner. 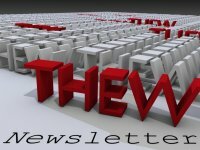 In this issue of the THEW Newsletter, we complete our review of methods to adress the dependency of QT interval to heart rate, hysteresis phenomenon and autonomic regulation. Drs. Halamek and Pueyo provide their expert opinion about methods developed to model the relationship between QT interval duration and the preceeding RR intervals. If QT adaption to HR and autonomic regulation of the cardiac ventricular repolarization seem to be the primary targets, the monitoring of cardiac arrhythmias in TQT is an additional item on the list of functionnalities described in the FDA request: "the tool shall be capable of providing identification of arrhythmias in long data and permit the reviewer to focus on these areas of a recording". Continuous monitoring of arrhythmias in TQT study represents an additional major step forward for the Agency. Finally and importantly, the access to continuous recordings enables the analysis of other dynamic aspects of the ECG such as T-wave alternans, heart rate variability and less clinically accepted ones, such as QT variability and heart rate turbulence, that are (among others) gaining credibility through independent clinical investigations. Yet, the upcoming challenge will reside primarily in the design of methods and tools allowing a fast and meaningful review by regulators (and sponsors) of all (or carefuly selected) cardiac beats from hundreds of thousands ones recorded in these safety studies. To conclude, this is a very exciting time for individuals/organizations involved in quantitative electrocardiography and cardiac safety, the need for technologies pertaining to digital Holter analysis in drug studies will generate opportunities and novel incentives to improve current Holter methods, to define Holter standards, and of course to improve drug safety and efficacy. Also in this newsletter, we would like to welcome AstraZeneca who became a member of our initiative. This major pharmaceutical company has purchased the full membership for year 2010-2011and have gained access to all data currently hosted in our repository. Finally, we present a new IT manager of the THEW. John Wade has joined our team this Spring and he is involved in te dvelopment of the IT for the THEW. We hope you will enjoy this next issue. Torsades de Pointes is a malignant arrhythmia associated with prolonged cardiac repolarization but is, however, frequently triggered by a sudden change in heart rate (RR interval). Thus, an ideal measurement of the QT interval should accommodate both QT dynamic, as well as static properties. Ideally, a QT/RR model should have a minimal number of parameters and yet effectively describe the static and dynamic aspects of ventricular repolarization. In particular, the behavioral properties of QT interval occurring after a sudden change in heart rate. In this work, we describe a transfer function model of QT/RR coupling based on control system theory, tested and optimized on multiple abrupt RR interval changes (exercise, mental stress, and tilt table testing) [2-4]. where qtxm and rrx are intervals with subtraction of mean levels QTxm=QTm-mean (QT), RRx=RR-mean (RR). Fitted parameters a1, b2, b3 are subject specific and are given by minimizing the residual between detected QT and QTm. An example of agreement is shown in Figure 1. Fig 1. Effect of bicycle stress: 50 year-old-male healthy volunteer. a) Detected RR and QT intervals. b) The agreement between detected QT and computed QTm. 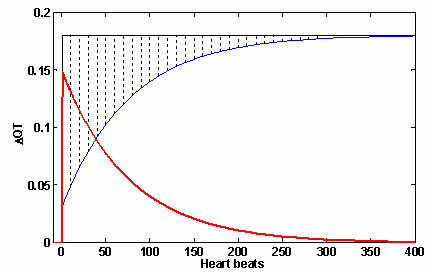 c) QT as a function of RR; red marks are single beats; the continuous blue line is the running average of QT and RR over 40 beats; d) QT hysteresis elimination by the model. RRf is filtered RR, detailed description is in . GainL: The gain of QT/RR coupling for slow variability of RR, i.e. the QT/RR slope, i.e. the amplitude of QT change that is achieved in steady state. GainF: The gain of QT/RR coupling for fast variability of RR, i.e. the amplitude of QT change immediately after the change of RR. 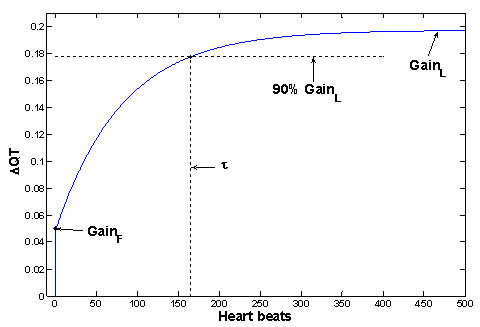 The delay τ is the number of heartbeats after which the step response has achieved 90% of the change needed to attain the new steady state value. Fig 2. The example of QT step response (for subject from Figure 1) and demonstration of QT parameters of physiological significance. The step response (i.e. the behavior of QT after unit sudden change of RR) is computed from fitted parameters a1, b2, b3. Similar shapes of step responses were achieved over all analyzed measurements, and the shapes are in good agreement with previous measurements [5-7]. The full set of QT parameters is given by these parameters (GainL, GainF, τ) and by QTc and QT random variability computed from the model. The effect of the QT hysteresis is minimized by this model as shown in Figure 1 . The QT static and dynamic properties are modeled. In comparison to other models, the residual between computed QTm and detected QT is minimized and the elimination of QT hysteresis is obtained [3, 4]. The shape of the QT step response correlates well with prior measurements [5-7]. It should be emphasized that this shape is a result of analysis and no apriori assumption about the shape is used for the analysis. Significant RR excitation is needed (preferably more than 200 ms change), and a sufficient number of associated QT intervals must be detected. Hence, requirement for beat-to-beat QT is required. Similar need exists in the model based on exponential weighting of RR intervals [8, 9]. Consequently, these methods are dependent on the accurary of the QT measurement algorithm. The QT parameters are not only subject specific, but also excitation specific. Only excitation specificity may explain different triggers of QT arrhythmias, different QT behavior with different stress, and different QT/RR slope between different autonomic regulation. The analysis of the dynamic and static properties of QT/RR relationship will help to better understand the QT physiology. Today drug cardiotoxicity is evaluated while neglecting both QT dynamic properties and excitation dependent QT coupling. It is well known that an abrupt change in the level of arousal or physical activity is a well-established trigger for malignant ventricular arrhythmia in patients with repolarization abnormalities . We therefore hypothesized that significant differences in the QT interval during early excitation relative to the steady state may assist our understanding of why there is a higher prevalence of malignant arrhythmia in certain situations. Such dynamic differences of QT intervals are directly proportional to the level of the QT/RR slope and the time constant of QT adaptation, and indirectly proportional to the level of GainF. The QT behavior on a sudden change of RR relative to steady state is demonstrated in Figure 3. The QT step response is given by the blue line, the QT steady state level by the black line. The QT difference is given by the red line, and corresponds to the dotted area between the step response and the steady state level of QT. The maximal amplitude of difference is seen at the time of RR change, and its level is (GainL - GainF )*ΔRR. The duration of QT difference depends on the time constant τ. Fig 3. The QT difference from steady state in sudden change of RR. The QT step response is blue line; the QT steady state level is the black line. The QT difference, given by delayed QT adaptation, is the red line; it corresponds to the dotted area between step response and steady state level. The dynamic aspects of QT interval coupling is likely to describe the clinical behavior of cardiac repolarization during the onset and offset of excitation, which in turn may assist our understanding of why “Torsades de Pointes” initiates in some circumstances and not others despite comparable levels of activity or rest. Furthermore, the testing of drug effects on QT dynamic parameters may elaborate why gender and certain specific physical states are more associated with drug-induced proarrhythmia. The proarrhytmic influence of drugs may originate in a change of GainL, GainF or τ without any change in QTc. Access the list of references here. When evaluating QT intervals, knowledge about the underlying heart rate (HR) is required. While one possibility for QT analysis would be to select ECG episodes preceded by stable HR, this does not seem an adequate option, since relevant information for arrhythmic risk stratification can be found in episodes with marked HR changes. The QT/RR adaptation method provides a characterization of the QT interval adaptation dynamics in response to HR changes. Taking those dynamics into consideration, QT analysis can be extended to more general scenarios. Until very recently, QT interval adaptation after a change in HR was mainly investigated in invasive studies, where the QT interval was shown to take at least two minutes to completely reach a new steady state after an abrupt change in pacing rate. In (1) a technique was proposed to quantify QT interval adaptation to spontaneous HR changes in Holter ECGs of post-myocardial infarction patients. That technique considers weighted averages of RR intervals preceding each QT measurement so as to account for the QT dependence on HR history. On average, the QT interval was found to require two and a half minutes to follow HR changes, although the initial tens of seconds to one minute were the most clinically relevant in the majority of cases. Both the duration and profile of QT adaptation were found to be highly individual. In agreement with results from invasive studies, the QT adaptation profile showed two distinct phases: a very fast initial adaptation followed by a second slower accommodation. A measure of the time for QT adaptation was able to discriminate between patients at high and low risk of arrhythmic death, with a more prolonged adaptation related to increased risk. The technique developed in (1) was later extended to account for possibly different QT adaptation characteristics along the ECG recording of one and the same subject (2). With that extended methodology, the time taken by the QT interval to follow HR changes was shown to range from just a few seconds in episodes of the ECG recording with little HR changes up to several minutes in episodes with large HR changes. Characterization of QT/RR adaptation, as described above, was used to assess prophylactic treatment with amiodarone in survivors of acute myocardial infarction (3). The QT/RR adaptation was found to be altered after chronic treatment with amiodarone, with different effects found in patients who survived and patients who suffered from arrhythmic death while on therapy. The observations derived in (3) suggest a potential use of indices derived from QT adaptation dynamics as markers for identification of patients who are not protected by the treatment with amiodarone. The ionic basis underlying QT/RR adaptation and its link to proarrhythmic mechanisms were investigated in (4). 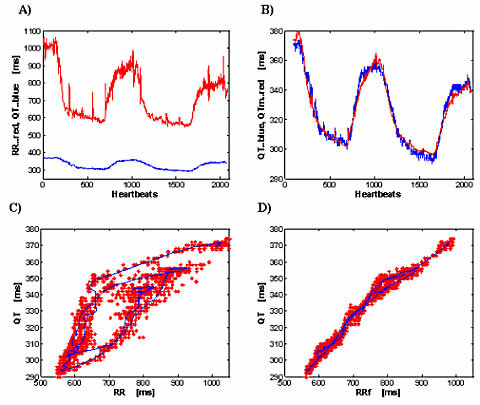 Computer simulations and experiments in human ventricular tissue were conducted, from which it was concluded that the QT interval follows similar adaptation dynamics to the action potential duration, in both cases consisting of a fast and a slow adaptation phases. While the fast phase is mainly driven by the calcium current kinetics, the slow accommodation is related to the accumulation of sodium within the cell. Increased risk of cardiac arrhythmias in patients with delayed rate adaptation could be a reflection of adverse ionic changes involving calcium and sodium dynamics that, upon further deterioration, may facilitate arrhythmia initiation via an increased likelihood of afterdepolarizations. AstraZeneca purchased a one-year membership to gain access to an international repository of data designed to aid industry and academic researchers studying the electrical activity of the heart. The database, called the Telemetric and Holter ECG Warehouse (THEW), helps researchers better evaluate how drugs affect the heart. Cardiac toxicity is one of the leading causes of removal of drugs from the market today, which is why ongoing research is needed to improve cardiac safety. In addition to helping industry and academic researchers better understand the electrical activity of the heart and how individual drugs may influence this activity, the data may aid the development of new tools to more easily detect drugs that can have dangerous effects on the heart. With the THEW partnership, AstraZeneca will gain full access to a wide range of electrocardiogrpahic tracings and the associate clinical information that can be used to develop, implement and validate electrocardiographic markers of drug cardiotoxicity. "We believe AstraZeneca's interest and involvement in this initiative is an important milestone. The support we have received from major pharmaceutical companies has grown over time and further support our decision to develop a repository for scientific data for the development of novel technologies related to cardiac safety," said Jean-Philippe Couderc, Ph.D., M.B.A, associate professor in the Division of Cardiology at the University of Rochester Medical Center and director of the THEW project. "We are hopeful that more pharmaceutical companies will see the value of the database and participate in this initiative as well, with the ultimate goal of improving patient safety and drug efficacy." 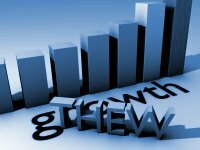 For more information about THEW membership visit here. Senior Operations and Systems Analyst/Progammer Sr.
John is the newest member of our team, he is a native of Rochester (N.Y) and a graduate of Rochester Institute of Technology (RIT) and SUNY Empire State College. John holds a MS degree in Professional Studies from RIT (2008) and a BS in Computer Science (2004) from ESC. He came to the University of Rochester in Aug 2008 with extensive IT experience leveraged...... His primary role in the THEW organization is responsibility for all aspects of complex day to day technical management and entire systems support.